It's unusual that one of the defining characteristics of a fighter with an 80% knockout ratio is patience. However, when considering undisputed cruiserweight champion Oleksandr Usyk, the unconventional often applies. Despite Usyk's size and physicality, he is essentially a mover, forever searching for angles and ways to penetrate a defense. However, he's not moving to skirt trouble; he's trying to initiate some for his opponent. He probes and pokes, always looking for a way in. As many elite fighters do, he will take a few rounds to see what he is up against before making adjustments. He doesn't even mind if he falls behind. With his superior conditioning and work rate, he will eventually discover his opening. None of this makes Usyk out to be a killer in the ring, and perhaps he's not. He's no search-and-destroy knockout artist. But as the great ones do, he finds a way to win, and he dishes out his fair share of hurt in the process. 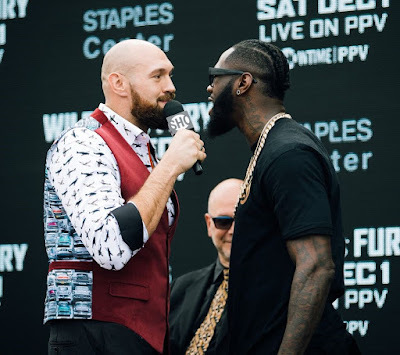 Whether it's the jab, such as in the Murat Gassiev fight, the work rate versus Mairis Briedis or the slinging left hand that he found in the eighth round against Tony Bellew on Saturday, he employs an enormous tool chest with which to work. And by the end of a fight, even the opponents that have made it to the final bell have been psychologically demoralized or physically beaten down (with Briedis being the one, notable exception). Bellew fought very well on Saturday. Winning a minimum of three of the first seven rounds, he consistently countered with hard right hands to the head and body. Even though Bellew was the significant underdog, he didn't let external pre-conceived notions cloud his performance in the fight; he was there to win. And with the Manchester crowd rapturously behind him, he fought valiantly and courageously, with the fans and fighter feeding off each other every time a solid right landed. 3. He relies on his chin. Bellew had the right game plan on Saturday. His best opportunity was to counter Usyk with something hard. And throughout the first six rounds of the fight, he had pockets of success, sometimes even more than that. In rounds two and three, his counter right hands were clearly the best punches of those frames. But as the rounds continued, a problem developed. Bellew's right hands weren't enough to discourage Usyk. Furthermore, as Usyk circled more and more to his right, Bellew's right hand became far less of a factor. 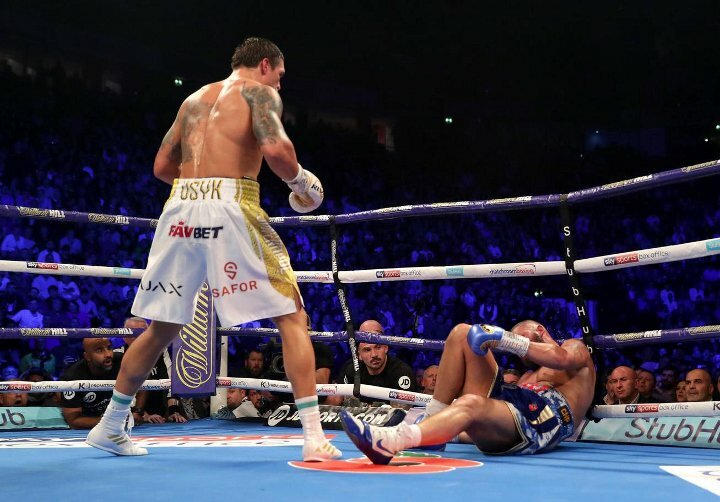 In addition, Usyk's constant offensive pressure led to Bellew exerting signs of fatigue. Whereas Usyk's jab was essentially a non-factor in the first six rounds of the fight, suddenly it started to land. 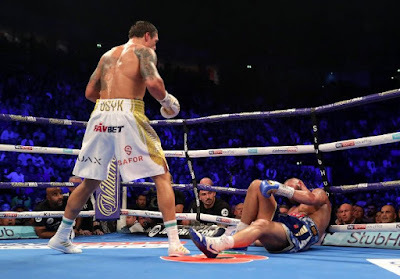 And in the final exchange of the fight in the eighth round, Usyk blinded Bellew with a right jab and then finished it off with a left hook. When interviewed after the fight, Bellew didn't even know what the final punch was; he never saw it. Let's back up a second though. Usyk's memorable final combination of the fight didn't occur in a vacuum. In fact, Usyk had landed a series of left hands in the eighth round prior to the finale. Bellew was still feeling the effects of one right before the final combination. In a clever bit of improvisation during the round, Usyk lowered the angle from where he threw his left hand. Instead of a direct, straight shot which makes a perpendicular angle to the rest of the body, he started to sling his left hand off to more of the side. In this position, he could use his hand for a cross or a hook. And Bellew wasn't physically or mentally agile enough at this point of the fight to defend Usyk's adjustment. After the fight, Bellew indicated that he will be retiring from boxing. Having given it his all on Saturday against one of the best fighters in the sport, there's no sense of disappointment or of an opportunity squandered. Bellew's emotionalism and salt-of-the-earth disposition endeared him to his fans and created a special bond. He was one of them. Not blessed with speed or superior technique, Bellew maximized his talent with self-belief and a willingness to take instruction. After losing to Nathan Cleverly in their first fight in 2011, Bellew didn't appear to be anything more than a tough domestic fighter. But he continued to improve and he didn't let his losses define him. 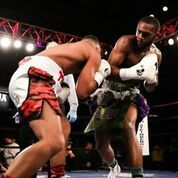 He was determined enough to fight through the defensive riddle of Isaac Chilemba to essentially even terms through two bouts (officially, he received a draw and a victory). He avenged his loss to Cleverly at cruiserweight, even after being down significantly early in the fight. He would go on to defeat credible cruiserweight contenders such as Mateusz Masternak and Ilunga Makabu (winning a belt in the process). Perhaps most notably, he beat David Haye twice at heavyweight when nobody but himself and perhaps his most die-hard fans thought he had in chance in their first fight. He retires with a record of 30-3-1, a champion and a recipient of multiple seven-figure paydays. Not too shabby. As for Usyk, boxing fans are licking their lips with anticipation for his entree into the heavyweight division. Now aligned with promoter Eddie Hearn, Usyk should be fast-tracked to a big opportunity in his next few fights. With his high work rate, superior footwork and conditioning, he should be a handful in the division. And while it will be a fun parlor game to envision how Usyk matches up with the best at heavyweight, let's not forget what he has accomplished in the first phase of his career. An undisputed champion, which is a rarity in modern boxing, he has fought for and defended his titles in six countries, never having a home defense in Ukraine. In short, he's been a bona fide world champion, a throwback to a bygone era where top fighters consistently sought the toughest challenges. Usyk's cruiserweight reign epitomizes the notion of prizefighting, and stands out in this current era of super promoters and boxers-as businessmen. Usyk, like other top fighters, will make his millions, but his money has arrived not through connections or hype, but from earning it – a strange and almost quaint concept in contemporary boxing. Let's also remember that Usyk has defeated a knockout artist like Gassiev, bangers like Glowacki, Bellew and Huck, superior athletes like Mchunu and Hunter and technical fighters like Briedis. He has dropped rounds. He has been beaten to the punch, but he has always found a way to win. In just a few short years he has proven that he is one of the best that boxing has to offer. And there's a sense that his story offers several intriguing chapters to come. On this week's Punch 2 the Face Podcast, we welcomed 122-lb. champ Danny Roman to the show. Roman recounted his last 18 months where he went from a virtually unknown club fighter to a world titleholder. Roman also talked about what's next for his career. Also on the podcast, Brandon and I looked back at last weekend's World Boxing Super Series action that included the Taylor-Martin and Burnett-Donaire fights. In addition, we gave our picks and predictions for Saturday's Usyk-Bellew clash. There have been a number of changes in the Saturday Night Boxing Pound-for-Pound Rankings since the last update. Oleksandr Usyk dominated fellow titleholder Murat Gassiev, winning by virtual shutout to become the undisputed cruiserweight champion. With his victory he moves up from #12 to #4. Saul "Canelo" Alvarez won a disputed majority decision over Gennady Golovkin. Although most ringside observers didn't have Alvarez winning the fight, the bout was close enough that the official verdict should be recognized as legitimate. With the victory, Alvarez maintains his position at #7 while Golovkin drops from #4 to #8. Sergey Kovalev was knocked out by Eleider Alvarez. He has now been stopped by his last two notable opponents. Kovalev now drops out of the Rankings. He was previously #8. Kosei Tanaka enters the Rankings at #15 after beating flyweight titlist Sho Kimura by majority decision. Tanaka, only 23, has now won belts in three divisions and continues to impress on the world stage.